What's the point of this? Rotten Applebaum is superior to that. Seems fine as long as it's not in your first few cards. Notably good with the demon-rush guy and the mulligan spell. Also worth noting is it announces itself to your opponent, which may not always be something you want them to know. Also worth noting that this is all the class-based heal left in warlock: Sacrificial Pact, Jeklik, Deathweb Spider, Siphon Soul. Warlock is probably the only class where a card like this would work. One cool synergy is to get two of these in hand, then shuffle them back into your deck via Plot Twist. With the right set up, you could get up to 16 healing in a single turn, for 4 mana. Plot twist synergy, you can put it back in your deck and get more heals. It's playable for sure, but could use more help. This card is very good, you tap for 2 mana, heal 6 and draw an taunt (overcosted). 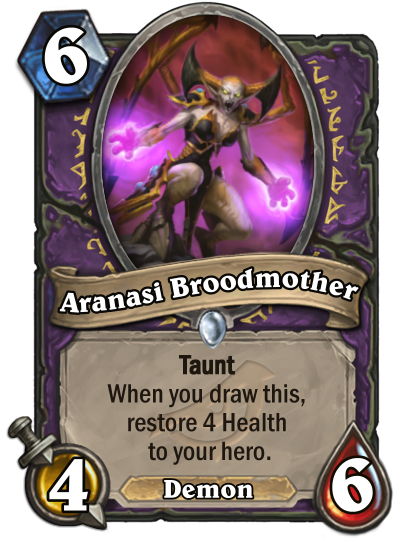 So this is a card that rewards card draw, very strong in warlock. Btw I can see "when you draw this do X" as a new keyword. The thing is, you can get this minion in the mulligan stage or draw it on turn 1/2. You still haven't life tapped, so you don't get anything. Not to mention, versus control decks the chances of drawing this minion early on and NOT being damaged is high. And if some people mention Life Tap - against control warlock is not going to tap, in order to delay the fatigue counter. Schade, I really like the on-draw effect. I hope the devs make more cards with this mechanic in the future (if they haven't designed others for RoS). Regarding Plot Twist - hmm. On the one hand I'm not convinced, that you will put two copies of this weak demon just for the free healing effect even if you multiply it with the powerful aforementioned spell. However Arch-Villain Rafaam makes this dead card playable, so I guess the Broodmother has some potential after all. Not exactly, Rotten Aplebaum need to be played for 5 manas and only heal your hero if don't silenced or transformed, this one need only to be draw. What match healing matter? Vs aggro, much better healing for free and spend your mana dealing with opponent treats than play a minion and hope he don't silenced or removed and you lose that many life in the attack again. Both cards are almost useless vs other archetypes. If this whole plot twist + Augmented Elekk thing works and is viable, this does heal you quite a bit, without you ever having to pay any mana for it. But that seems like a big if to me. Hey Rogue healing with Academic Espionage and it fixes the pesky mana cost problem!! Just kidding. I honestly don't think this card is that bad. Terrible if drawn on turn one or two and not great on three. But Warlock is a class that really use the healing and has multiple ways of leveraging it's HP as a resource making the heal from this more likely to land than not. The cost is a bit much but it does have taunt. I think we have gotten use to seeing crazy combo stuff happening in standard. Which would really devalue this card. It seems to me they are trying to return back to a more traditional minion board control type of meta with the rotation. Less clears, more combo disrupters, and lots of value cards is what I am seeing. In which case this card is actually pretty decent. If you can average 10 Health off of it (heal for four and blocks at least 6 damage) with a single trade then I think it's worth playing.